On 29 June, I attended an interesting afternoon about the drafting of legislation and some of the difficulties it poses, with some discussion of the translation of legal documents thrown in too and a lot of interesting input from the audience from legal interpreters who often have to deal with the complexities of legal language and explain them to the ordinary man. 6 speakers presented different issues relating to law and language (and raised the topic of legal translation). Brief summaries are set out below that highlight the key issues of interest in the translation of legal documents. Hayley Rogers, a UK legislative drafter, outlined the UK legislative drafting process and some of the difficulties it presents. She argued that legislative drafters tend to see themselves as ‘architects’ but often the practicalities of the drafting process mean they are actually more akin to ‘cowboy builders’ creating chaotic-looking legislation because of a series of constraints (primarily political and policy-related) imposed on the drafters. So instead of striving for perfection they often just have to cope with the world ‘as it is’. This may resonate with legal translators who face demands for perfection from clients, but are constrained by real world factors like short delivery deadlines. Prof. Maria De Benedetto spoke about how the language of the law is often incomprehensible to the layman, how it is a language of the elite, and outlined some of the techniques those who speak the language of the law utilise to maintain their elite status, such as reliance on Latin when ordinary people are unlikely to comprehend it. James Hadley is new to legal translation as a discipline but comes from a strong background in translation theory. 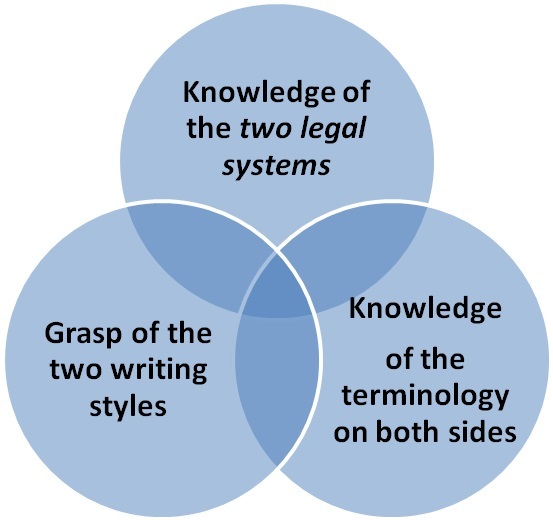 He is currently involved in a project being run by the Institute of Modern Languages Research (IMLR) in partnership with the Institute of Advanced Legal Studies (IALS) exploring some of these key questions that arise when laws and legal documents need to be translated from one language to another. His presentation looked at equivalence and legal translation and his working hypothesis is that equivalence (defined as “the notion that a translated text produces the same effect for its readers as the source text did for its own” may be demonstrable in legal language. Nothing original here, but it is always good that key issues in the discipline are presented to new audiences and that more people become educated about legal translation and what it entails, who can do it, and so on. William Robinson, Associate Research Fellow at IALS, spoke about the complexities of the EU drafting process, highlighting the important role of translators in the overall process. Stephen Neale, Professor of Philosophy and Linguistics, examined the question of ‘interpreting’ the meaning of words and highlighted the importance of context in coming up with good and bad faith interpretations of what legal words actually mean. He pointed out that judges, often considered to be the final arbiters of what the law ‘means’ often don’t have a strong grasp of linguistics, and gave some examples of ‘weird’ outcomes in cases where the judges appeared to go against the ‘common sense’ meaning of the words. His assertion is that there is a set of heuristics we use all the time to figure out the common sense meaning intended by others and that intrinsically we all know when an ‘interpretation’ is in bad faith. Jerome Tessuto provided a data-driven analysis of how writing styles and language conventions from one country can influence those of another, by looking at the impact of English arbitration legislation on Singapore’s arbitration legislation. He pointed out that while deontic modality, and the use of shall in particular, is on the decline in English legislation because of the impact of the Plain Language movement, his data revealed that it was still important in Singaporean legislation, though an audience member who was a legislative drafter from Singapore pointed out that recently that has begun to change.